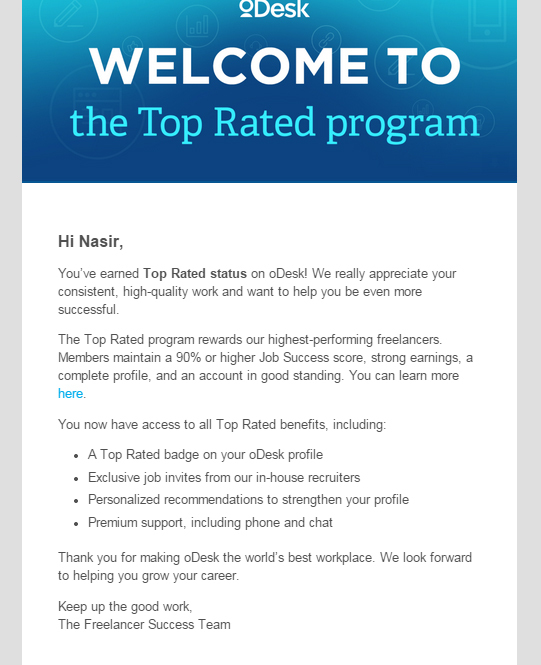 Thanks to Almighty God I received email from Odesk(now Upwork) in March 2015, for being a top rated freelancer with 100% job success rate. I am adding here few tips and tricks for upcoming freelancers. I will keep updating this article with time. I had 6 years of experience before entering the freelancing field and I left office job only when I felt confident that I can handle projects alone too. In 2012 I started freelancing with much savings in bank so that in case of no jobs in freelancing I can survive on that saving. So basically you should be patient and also knows how to manage your savings and earnings too for freelancing. The biggest thing is that you will be much more successful if you will have as maximum possible experience of your field before starting freelancing. I left office job being a team lead and had good experience of handling clients. Your clients will be mostly english speaking so this is also must requirment. So to summarise a bit. Good field experience so that you can handle client needs alone also. Good English – at least you should know when you are talking about past, present or future. A lot of patience in the start and once your profile will have few jobs with good reviews and 5 stars rating, you will start getting jobs easier with time. I got my first full time job after 2 months. I would recommend two steps for applying on jobs. For intial few jobs always prefer that you get 5 stars ratings and good reviews and not at all focus on money. Start applying on low budget jobs. You can take risk of applying on the jobs for clients with no history too. If you get bad review, return the money to client because if you will return money it won’t show on your profile. So basically first few jobs only and only focus on getting 5 stars ratings. Once you will get few jobs with 5 stars on your profile, then start taking care of selecting clients. Always prefer the client whos history is full of good reviews and ratings. Odesk has an advantage that if client leaves bad or low ratings then you can ask them to change it(within 14 days of contract ending) by giving solid reasons and if client agreed he might will change it too. Quality of your work should be your first priority rather keep thinking that when you are going to get money from client. You should start with low rates in start unless you are exceptionaly highly skilled person and then gradually increase your rate. Take tests, add previous jobs and experience, have good portfolio photo(rather a kids style selfies) and make your profile 100% complete before applying on any job. While talking to clients you should talk v pleasently e.g always use please, sorry, thank you, regards and all such words while communicating with client. Always deal client by thinking that how you would like to be treated being a client yourself. Please always try to find your question using google search first and then ask anyone else. When starting freelancing I got my more than 98% answers from google and I didn’t ask anyone. Freelancing simply means you are totally on your own and its your solo flight, its all about you that how well you can handle it. Please don’t just ask general question “I want to start freelancing please guide me.” No one will answer to this question. You should have done your basic research on freelancing as there are millions of blogs explaining basics of freelancing. Always please come with specific questions about freelancing and then anyone will help you out surely. Please note that I am a programmer, so might be above tips might not work 100% for every one like designers or writers etc but overall they will be helpful generally. Above all things always pray to God and have trust in Him. Freelancing Freelancing, Odesk, Top rated freelancer, Upwork. permalink.